Are you sure? It’s pretty high,’ I ask Dan. 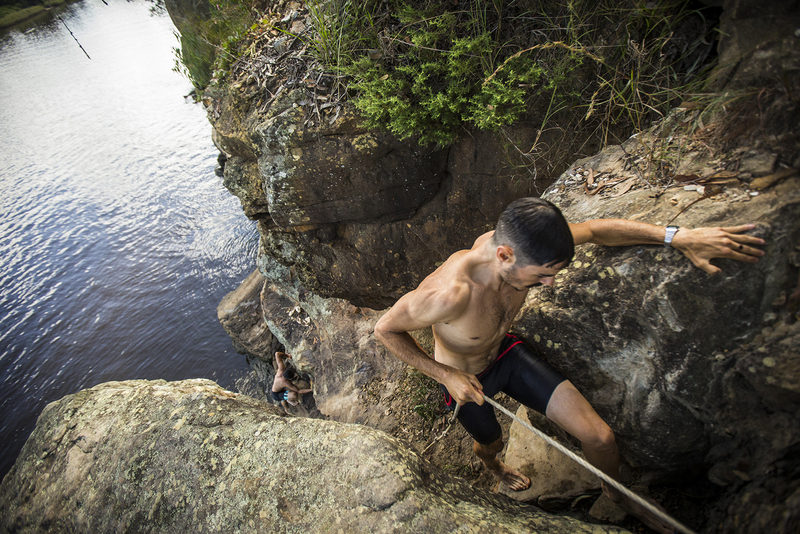 His fingertips are white, digging firmly into the rope, while my toes curl over the rock ledge, peering down. ‘The jump is quite a long way. It should be deep enough,’ he replies, referring to the murky shallows below. His comment is followed by a smirk, which I take as a sign his enthusiasm is tinged with doubt. ‘Pass it over, I’ll have a go.’ My reply jumps an octave or two, all certainty disappearing before I even finish the sentence. Boats and jetskis roar past, their wake lapping against the rocks below. A sheer sandstone cliff rises, and rooted into the rock platform 10 metres above is a slender eucalypt leaning over the edge. A row of boards snakes along the trunk, nailed in, creating a makeshift ladder. Atop hangs a woven thread, faded and frayed from the elements. I’m clutching onto the knotted end, fingers intertwined around the knots, measured and marked from previous summers. 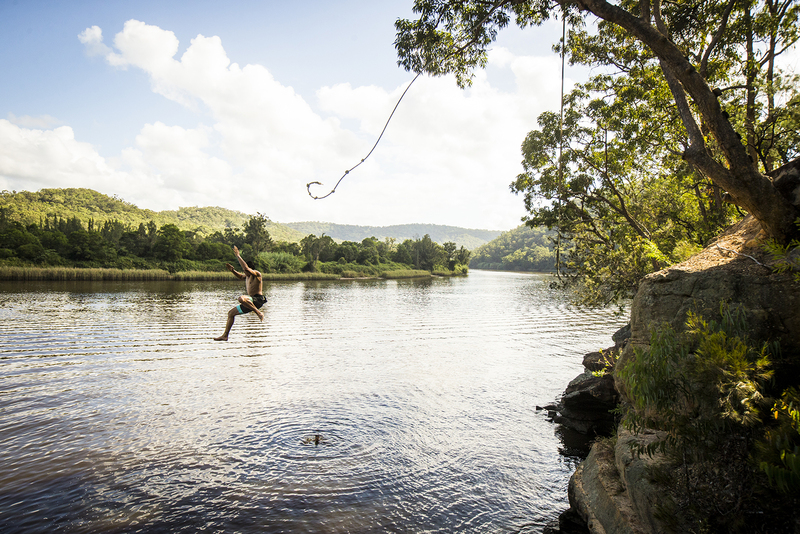 We’re yet to reach our day’s destination – Wisemans Ferry, at the northernmost point of the Hawkesbury River. Ideally, I’d like to get there with all bones intact. 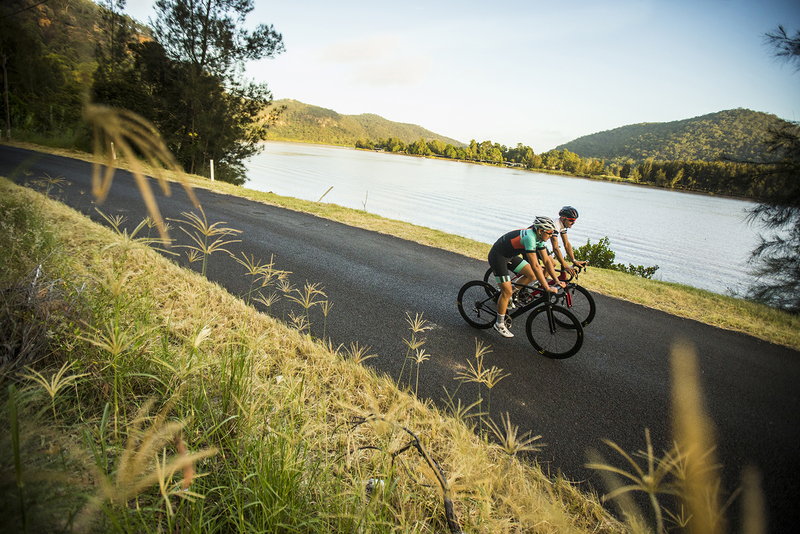 The last time I rode along the banks of the Hawkesbury River – also known by its Aboriginal name, Deerubbun – it was over 18 months ago and some 20 degrees cooler. Dan was there on that occasion too. We’ve thought about revisiting many times since, but the 180km round trip from Sydney’s CBD is just a bit too far. This time we’ve driven to the outskirts of the city, avoiding the 25km stretch of highway, escaping the traffic and making the highlights of the region well within reach by bike. Situated on the north-western edge of Sydney, along a ridge running between the deep valleys of Cowan Creek and Berowra Creek, sits Hornsby. 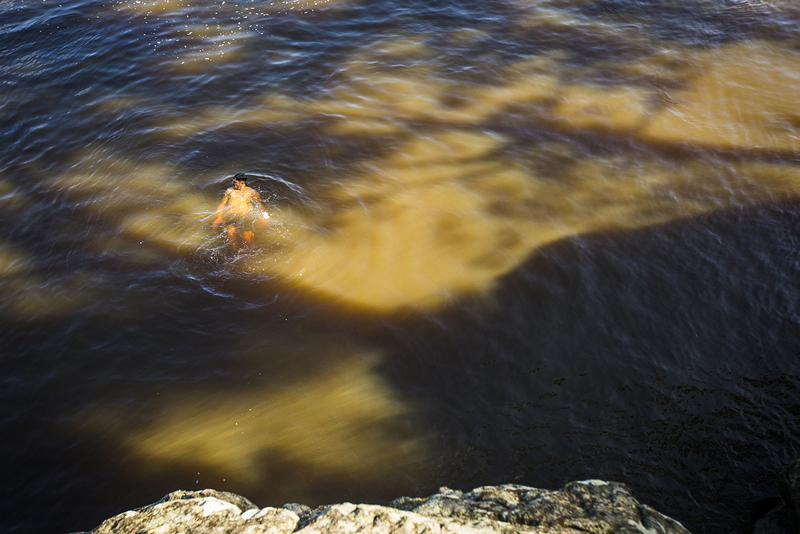 The water creates a natural green belt, containing the sprawl of Sydney from encroaching on the vast bushland to the north, where the Indigenous nations of Guringai and Darug meet. 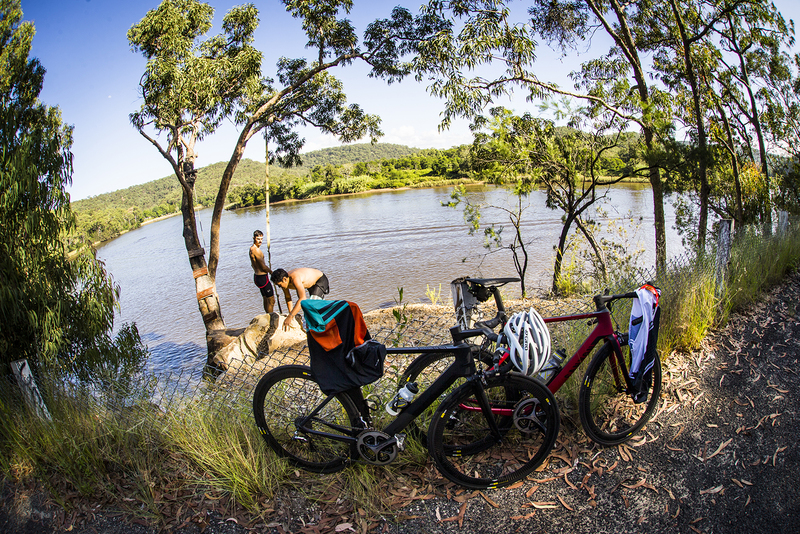 These waterways are familiar to most Sydney cyclists – Cowan Creek features Bobbin Head Road, and Berowra Creek has Berowra Waters Road and its classic ferry ride. 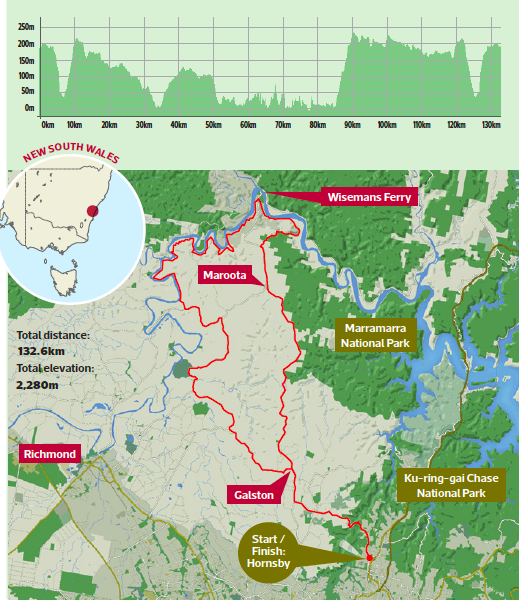 However, our Big Ride won’t be visiting either of these tributaries of the Hawkesbury River on this occasion. Rather, we’ll be heading upstream and rejoining Deerubbun at Wisemans Ferry. I meet Dan Bonello and Tim Bardsley-Smith at Hornsby Park, the southern end of the ridge. It’s well past first light, but still early enough that it shouldn’t be this hot – the tarmac along the Pacific Highway is already baking in the morning sun. Fortunately, after 800 metres we leave it behind, turning left and heading west down Galston Road, saying goodbye to the last traffic light we’ll see today and beginning our first descent. Closer to the source of Berowra Creek is another crossing of this valley: Galston Gorge. 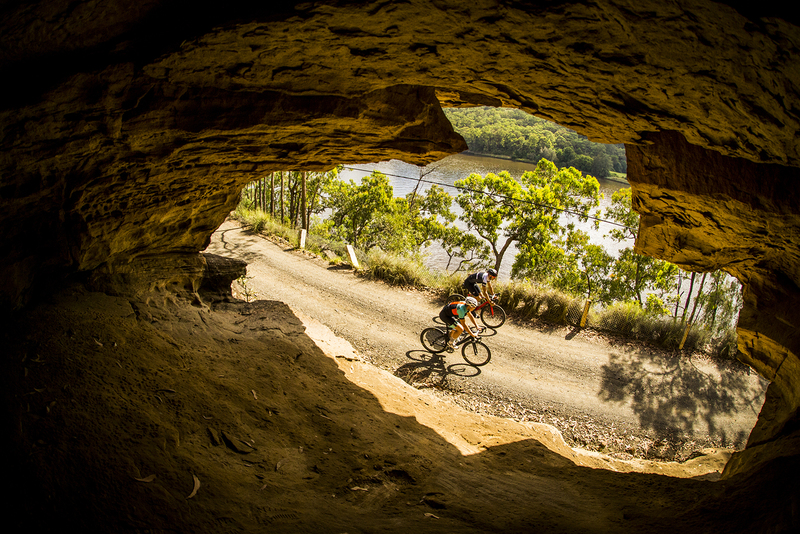 This is known as the “third” gorge to local riders, after Bobbin Head and Berowra. 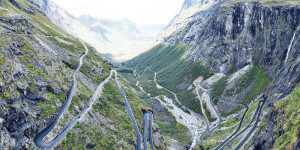 The region has probably never been likened to the Italian Alps – nor will it ever be – but like the Stelvio Pass, Galston Road has switchbacks (albeit 43 less). To celebrate this fact, we’ve even brought our European bikes. The Canyon Aeroad proves nimble through the corners; thankfully, Dan’s still warming up, so he’s taking it relatively easy. This offers me a chance to also enjoy the view. The road hugs the cliff face looking out towards the west, offering glimpses of it as it cuts back below. 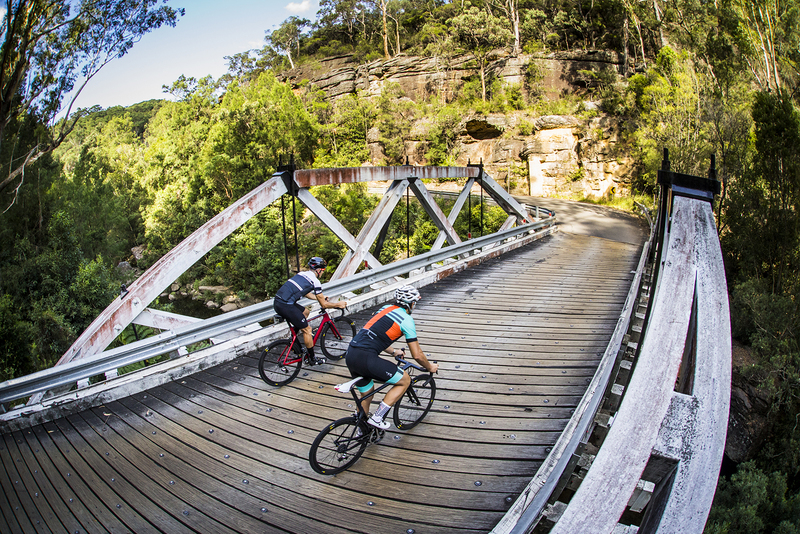 The descent brings a chill when we hit the shaded creekbed and cross Pearces Creek Bridge over Tunks Creek. The truss bridge is a small relic of the much grander efforts of colonial expansion through the region; there may have even been some forward planning for our kind in 1893, the wooden decking running diagonally perfect and avoiding any risk for our skinny road tyres. Coming out the other side we ascend amongst the tree ferns and seeping rocks for the next 3km, the much greener bushland indicating the eastern side of the gorge is protected from the harsh afternoon sun. It isn’t long before we’re through Galston township and meeting the intersection of the UNESCO World Heritage listed Old Northern Road, or “Great North Road” when it was built. One of the greatest colonial engineering feats of its time, it’s a single road connecting Sydney all the way to the Hunter Valley and on to Newcastle, taking up to 700 convicts per day over 10 years to build. Nowadays it’s just another quiet country road – but for a cyclist from the city, that’s perfect. We spend the next hour heading north-west along Cattai Ridge Road and Halcrows Road, through horse studs and farmland. The profile points downwards, but it’s rolling with some deceptive pinches along the way. 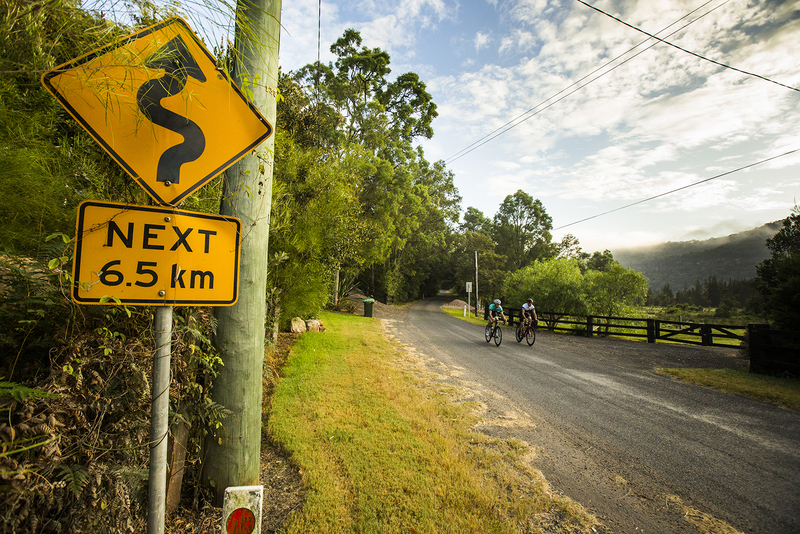 The turn onto Wisemans Ferry Road is soon followed by a quick descent back down to water level; we nearly meet the Hawkesbury at its most upstream point on the route. The river is just beyond reach and out of sight, but its proximity is evident with the natural wetland flooded by Little Cattai Creek. The road bottoms out among the black swans and Cape waterlilies. A few quick bends later and we’re back up onto the sandstone ridge. Between the huge houses and stone walls are views stretching west over the plains of the lower Blue Mountains. A cornfield interrupts the country manors, which signals that we’ve reached Maroota and our juncture of Sackville Ferry Road, immediately immersing us back into thick eucalypt scrub. The tarmac narrows after a right turn due north on River Road. Stepping along the rocky ridge the slopes soon disappear and the bushland gives way to fertile paddocks and beached speedboats. 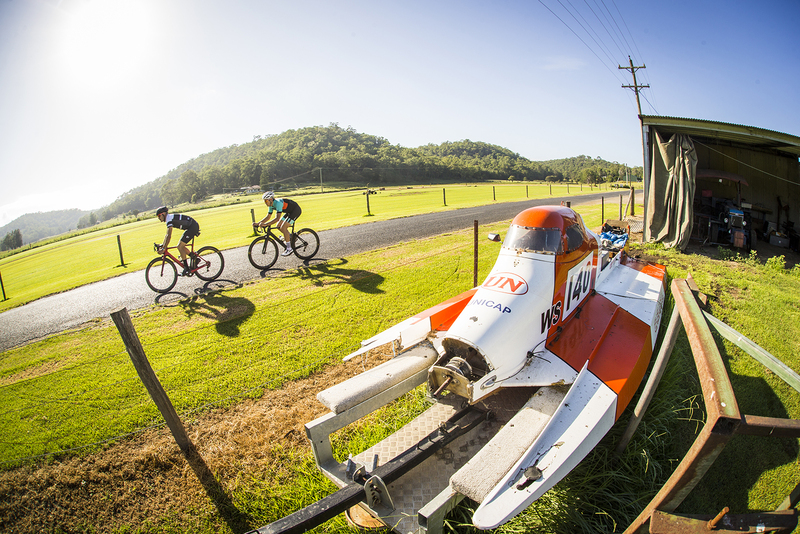 River Road skirts the Hawkesbury for the next 30km. The road ducks in and out of the thin, tree-lined banks, offering the best views when it’s atop the sandstone edges, along with chances to catch that cool breeze whipping off the water below. The road feels deceptively high with the width of the river and floodplains stretching out so far below. As we head north, meandering along Deerubbun, we criss-cross the threshold of the Darug and Darkinyung nations. The waters below have been continuously carving their way through the bed of Hawkesbury sandstone over the past 200 million years, all the while nurturing the unspoilt bushland right beneath our wheels. The scenery and landscape are impressive but unremarkable when you think about Australia’s array of majestic rivers. Looking around, I try to imagine what attracted tens of thousands of years of continuous inhabitation by Indigenous clans, and the motives and determination of colonials in their pursuit of conquering this land and its people. Is some natural beauty more sublime than others, or is it what this land provides? Or could it be what lays beyond our gaze? The bush is showing the toll of the heat. We’re nearing the end of summer, and one of the longest hot and dry periods Sydney has ever witnessed. The leaves crackle in the breeze and the gums bleed with deep red sap, but nearing the water we encounter another plain of lush, green pastures. We can tell the grass is wet just by the sweet smell. The paddocks are bordered by white picket fences flanking our arrival into the meeting of the Colo and Hawkesbury Rivers at Lower Portland, named after an English duke whose resemblance was thought to have been seen in the headland above. Although we don’t cross the river to the village, the old wooden barns and deciduous trees show the remnants of another settlement, the ferry crossing providing what was undoubtedly another invaluable supply link across the river. By 1789 the entire Hawkesbury had been navigated by Europeans and settlements had sprung up on both sides of the river. These became the gateways to the sea and the north country farms of the Hunter Valley provided Australia’s first inland supply chains, feeding and fuelling the expansion of the new colony. Produce and livestock came from the farms in the lower Hunter Valley, newly discovered coal shipped down from further north and labour provided by the convicts, the most villainous of whom were transported to Newcastle. Back in the bush and along the river the day is heating up, but the dry eucalypts provide some shade. Sections of the tarmac give way to dirt all-weather roads, ground out of Jurassic sandstone. The white sandy surface feels cooler than the black asphalt. The jarring ruts wake us from our leisurely pace and we pick it up, skipping and sliding across the dirt, the crunch of tyres cutting into the sand. Dust and airborne pebbles deter me from sticking on Dan’s wheel too long, keeping me honest. The sweat collects the road’s orange dust. My vision’s becoming a bit blurred, but I can’t take my hands off the bars long enough to give my sunglasses a quick wash and wipe. The road continues to rise and fall by the water’s edge, never quite touching the surface. It snakes beside it for 30km, ducking and weaving north and south along its easterly path. We race along, making the most of the relatively flat gradient and getting the tougher dirt sections out of the way. The extra effort pays off, speed helping us skim over the rougher sections. Though it flies by, we do admire the sandstone features, cliffs and caves peeking out of the bushland over our right shoulders. A few striated shelves pass overhead, almost close enough to reach out and touch. We rise again over a cliff, when Tim pulls us over. He has spotted a rope swing. ‘Come on, do it. It’ll make a great shot,’ Tim enthuses. Soon enough, we’ve propped the bikes up against fence posts and are taking off our shoes, hanging our jerseys and socks on the wire netting. The cliff looks about 10 metres tall – not too high, but the water doesn’t offer more than 30cm of visibility, and it’s definitely low tide. The ropes are fixed to a skinny gum perched over the cliff. Dan grabs a long stick and, balancing carefully, feeds it out over the edge. He hooks the rope and pulls it back in. Meanwhile, I keep peering over the side. I still can’t make out the depth, or the distance to clear. I draw the short straw and Dan passes me the rope. Steadying my footing, I pull it as close to my chest as possible. ‘One, two, three,’ they count, but aside from some possible toe flinching, I remain firmly rooted to the ground. It has been at least 10 years since I’ve used a rope swing, and in that time I think my sense of self-preservation has taken priority. I’ll try it again. I gain momentum as the water passes below. I can’t sense the apex of the swing, and I’m sure I let go too early, plummeting straight down instead of in what I’d hoped would be an impressive arc. It’s a blur until I whack the surface, my chamois coming in handy against the blow. I open my eyes, squinting, expecting the sting, forgetting this is fresh water. My entire field of vision has turned a tea-coloured shade, bubbles the only recognisable feature. I come up and lay back to watch Dan, but soon realise there’s a fairly strong current and so decide perching on the rock ledge is a better option. There are no backflips from Dan, sadly, but the perspective below does give me a real idea of the height. Tim offers some creative modelling advice and we decide to jump again. Dan effortlessly scales the rock wall and repeats it; I find the second jump even more intimidating. Back on the roadside we’re attempting to dry off, doing our best to avoid muddy feet and wet shoes. Our kit feels refreshing and cooler while it’s still damp. 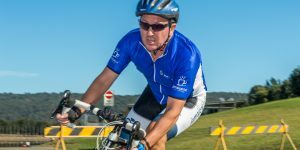 We pass a few pairs of tourers – not even Audax riders, but rather old mountain bikes with wide bars fully loaded with panniers and camping gear. We’re not sure where they could be going – maybe following the long road north? Soon enough we reach the settlement of Solomon Wiseman. 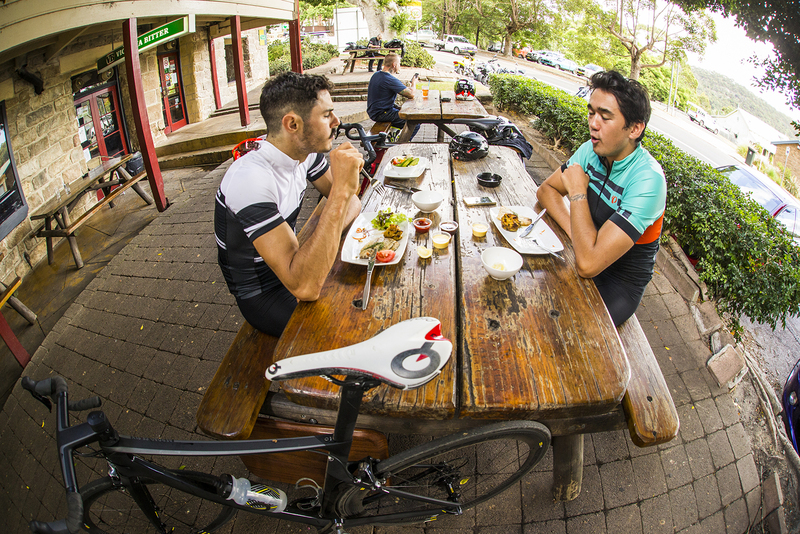 We park the bikes on his front porch and head into his kitchen – now a bistro – for a quick refuel before the leg home. If we weren’t on deadline, we might have even been able to sneak in something besides a soft drink. Wiseman, a pardoned convict and lighterman, settled this land, shipping coal, wheat and timber along the Hawkesbury. He persuaded the government to build the Great North Road through his property and also established the ferry route, which still runs today. By 1826 he had built an elaborate house, Cobham Hall – now the Wisemans Ferry Inn. This ode to colonial grandeur is still serving us well. Back on the bikes, we look up at the headland south and wonder what lies further downstream, so we pass the junction of the Old Northern Road and instead head down Singleton Mills Road. The flat floodplain is a welcome sight, but realising the need to go home at some point, we take the last turn up Laughtondale Gully Road. Once we’ve rounded the gravelly corner and passed the potholes, the gradient goes up and the vegetation changes: rock shelves covered in Gymea lilies, their stalks towering over us. Paying close attention to the hazards, we manage to stay upright on the right side of the gully to a plateau, Devils Rock, at the top where we rejoin the Old Northern Road. Although colonial history is rich here, this came at the expense of the traditional landowners. Sadly, with the quick demise of the Darug, Guringai and Darkinjung people, much knowledge of their land usage was lost – but the significance of this area becomes evident when we roll by the sacred site of Devils Rock. Upon this sandstone outcrop are carvings of kangaroos, emus, tracks, and that of an enormous figure, Baiame, the Creator God, whom they believed to have created not only the laws and traditions, but all the country as far as the eyes can see. We take another moment to appreciate it all before continuing on. We agree to take the most direct route home, the way the settlers had intended via their road. Retracing the convicts’ steps, we head back to where it all began. 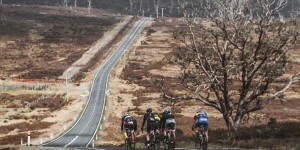 By the time we reach Galston Gorge, my legs are sorely feeling the 2,000 metres of climbing. Dan takes the opportunity to turn the screws one last time and launches out of the saddle at each hairpin. Back in the saddle his cadence is bouncing, making three bike lengths out of each corner. I admit defeat, knowing the car, a cold drink and a change of footwear is only a few kilometres away. Taking it easy after the last switchback and soaking up the afternoon sun on the western-facing slope, I search for Deerubbun in the distance. It’s completely out of sight, but I know it’s hidden behind that valley, or the next, or maybe the one after that. The exposed ridgeway offers one last opportunity to gaze over the ridgelines. I try to imagine how it all came about: from Jurassic oceans settling into flat sandstone bedrock, crunched and folded over millions of years; or Baiame carving through the mountains and valleys; and forward, to the wild desires of the surveyors hoping to tame this wilderness and the convicts laboured to the gruelling task. Its history has been revealed in glimpses, and as we venture deeper north, sometimes dark and murky, the stories are as much embedded in the banks of the river as in the roots of a new nation. Age in years of Wiseman’s Inn, our lunch stop. Speed in kmh of Dan’s ascent up Galston Road. Speedboats passed on River Road – more than the number of cars. Energy bars or gels consumed – save them for race day and enjoy the local fruit stalls and counter meals. Elevation (metres) of the lowest point of our ride. 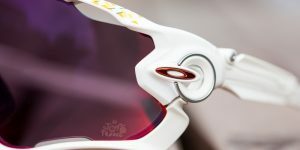 We know that every few years the big bike companies redesign, redevelop and relaunch their models, complete with their latest breakthroughs in technology. 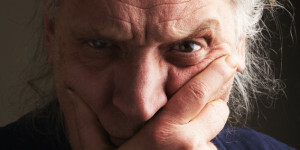 Recently, however, more focus has been placed on the aesthetics of their models. Canyon came along and set the benchmark in this regard. In Australia these bikes are still relatively rare – maybe it’s their unique design, graphics or scarcity that makes them the envy of us all. 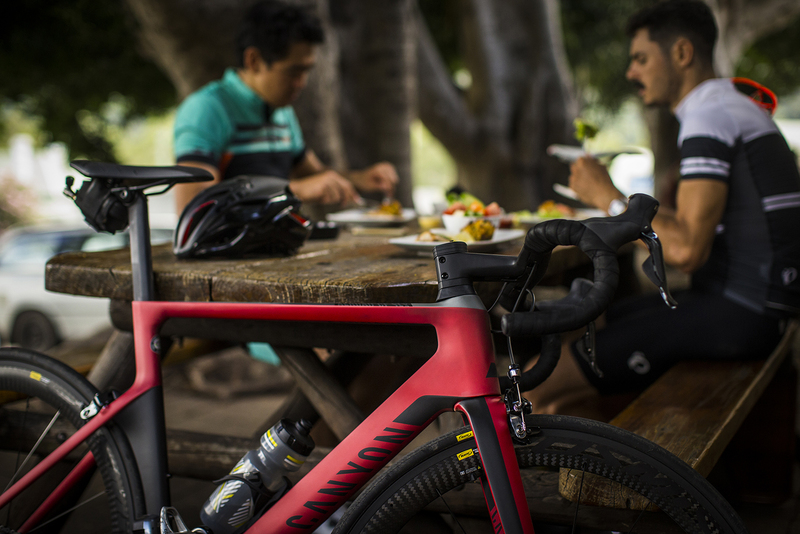 The Aeroad has gone a step further for Canyon. The frame design, integrated headset, stealth-black exalith-coated Mavic Cosmic wheels, direct mount brakes and recessed bolts all add to its appearance of pure speed. It may go some way to explaining all the acronyms after its name, too. 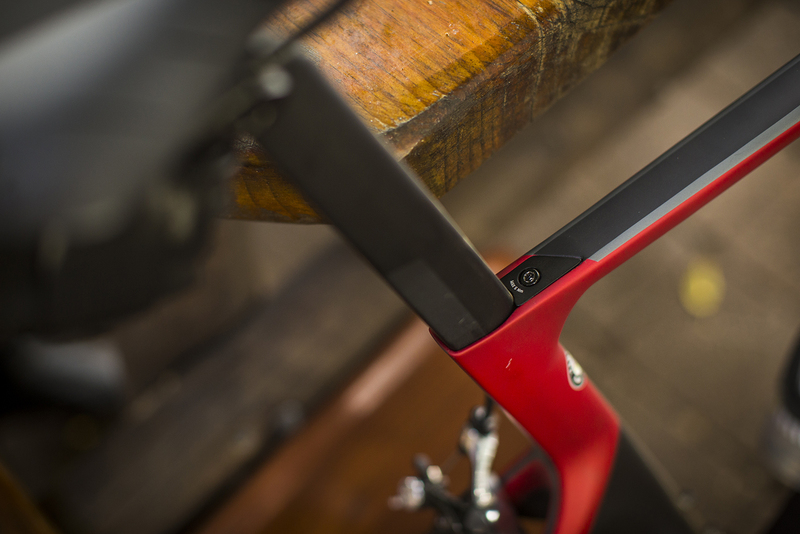 With a frame weight of sub-1kg, it isn’t just an “aero” bike. 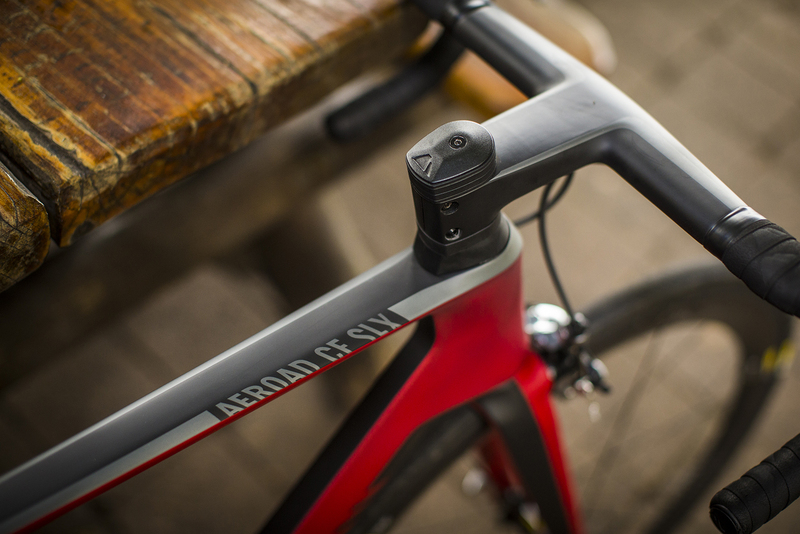 On first ride, and the descent down Galston Gorge, the Aeroad remained relatively planted; the weight distribution, however, was slightly different to a conventional frame design. This might also be remedied in its built-in fork rake adjusters. 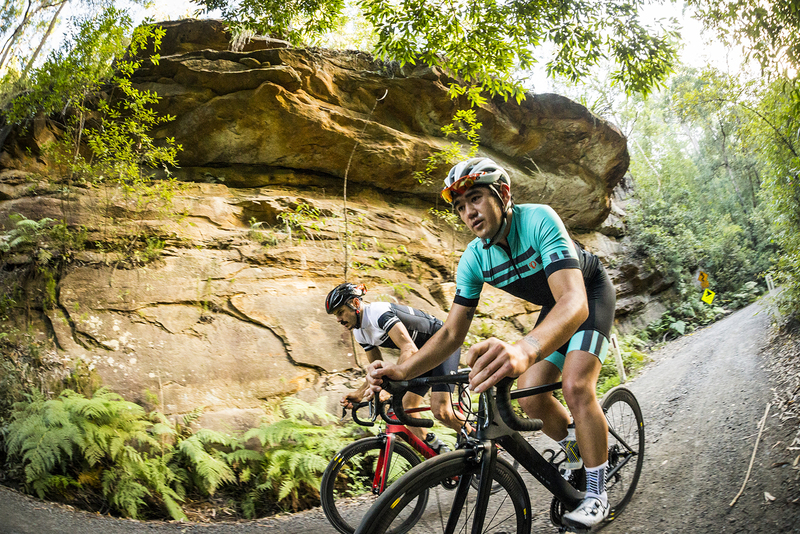 On climbing, the bottom bracket transfers power through the drivetrain, and combined with the weight the bike glides up hills. 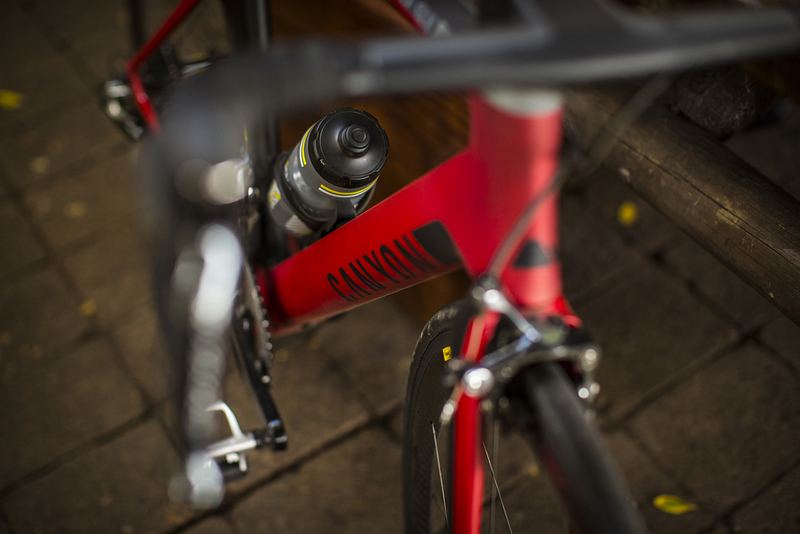 This is the most rewarding aspect of the ride – that drivetrain stiffness really propels it along the flats. 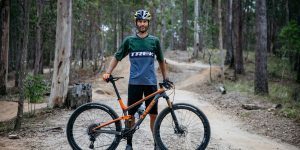 The stiffness proved a little harsh on the dirt through the potholes and ruts, but our expectations are a bit unfair; this ride isn’t exactly designed to be a gravel-grinder or cross bike. 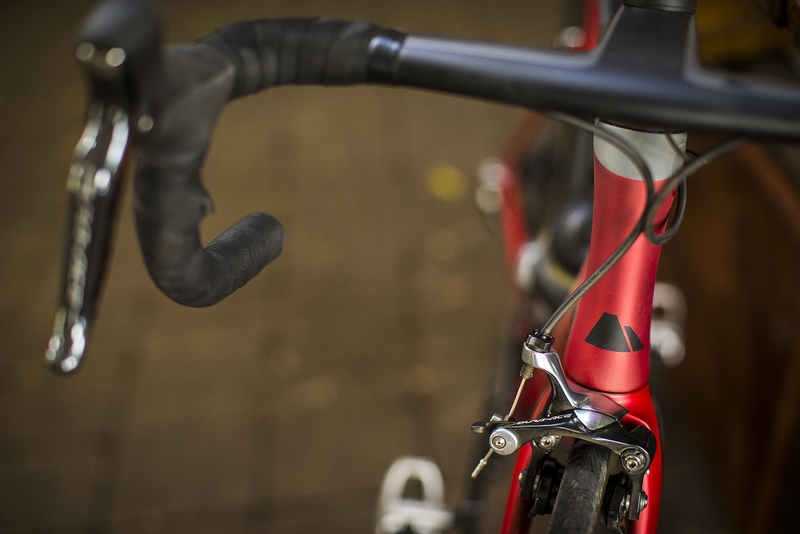 Even so, the frame provided enough clearance for the dirt-trodden Mavics, and the DI2 didn’t miss a beat. Follow Cyclist’s route – not quite the one the colonials intended, but close. 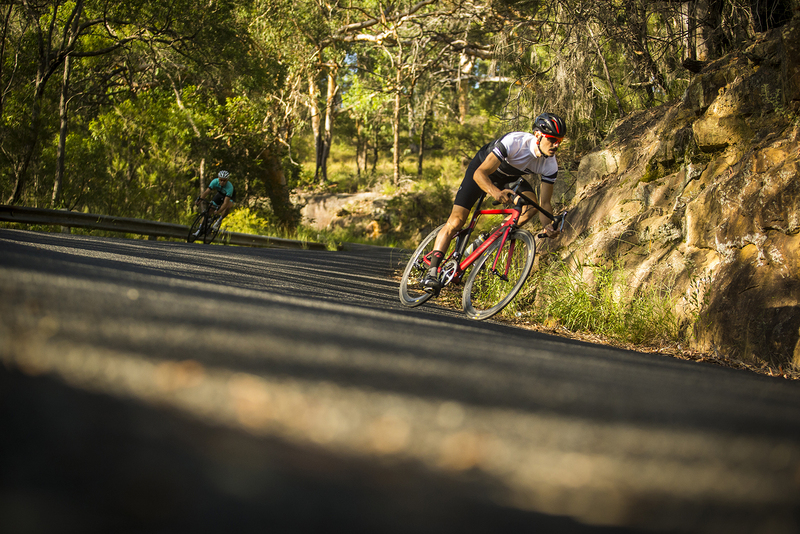 The route from Hornsby is approximately 130km in distance – much more manageable than the 180km plus return from Sydney’s CBD. It also skips all the traffic of the Pacific Highway. From the centre of Hornsby, head north, turning left on Galston Road and past the first and last traffic light that you’ll see on your ride. Follow Galston Road down the gorge and up the other side, through Galston, onto Mid Dural Road, and take a right turn onto the Old Northern Road. Once on the Old Northern Road there are plenty of opportunities for shortcuts and detours. 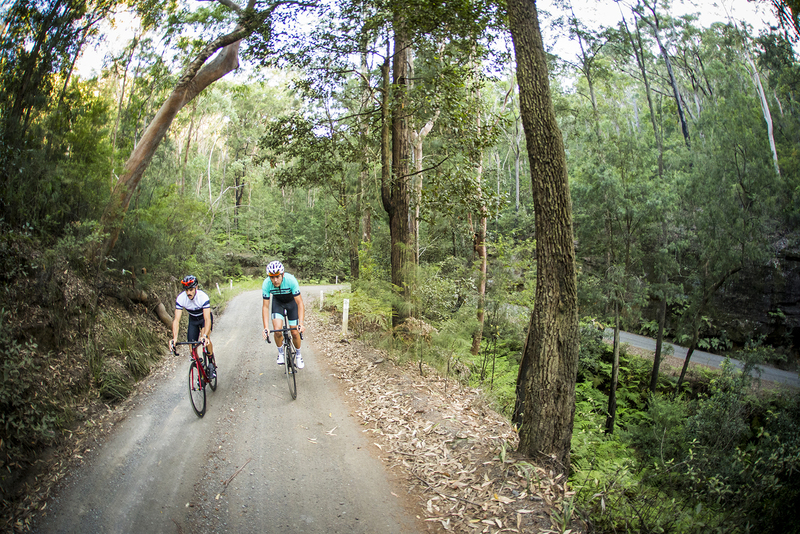 Our route leaves it after 3km, turning down Cattai Ridge Road, onto Halcrows Road and then onto Wisemans Ferry Road. These are all quite well-marked country roads. 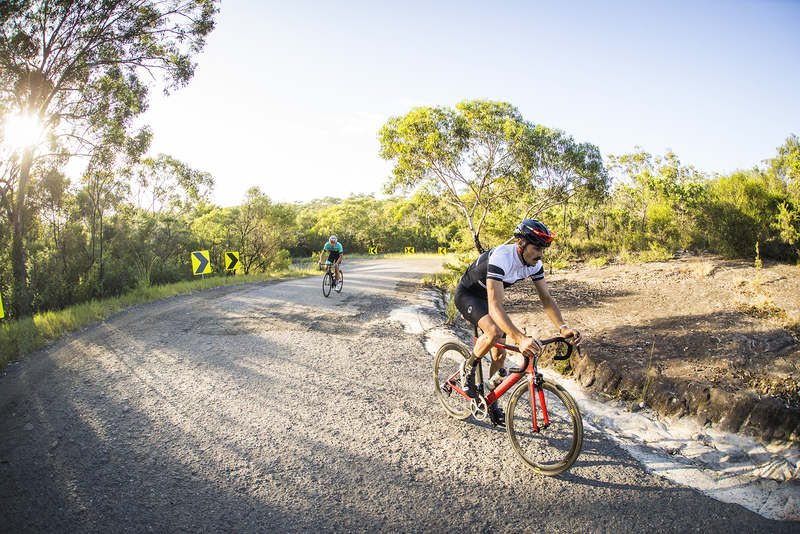 Instead of taking the most direct route to Wisemans Ferry, this route takes the longer and more scenic option: a sharp left at Maroota onto Sackville Ferry Road, followed by a right turn onto the narrower asphalt of River Road. 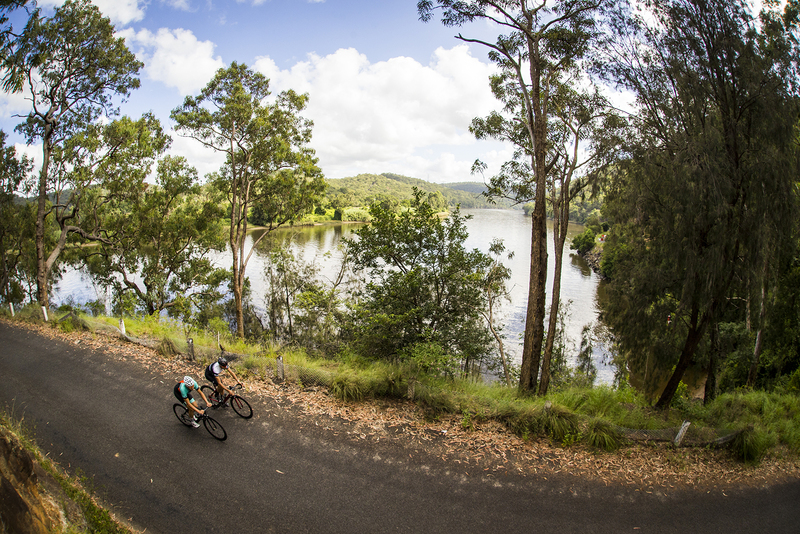 River Road hugs the Hawkesbury River for the next 30km, offering the most scenic stretches of the route. Once at Wisemans Ferry there are a few shops at which to refuel, before continuing along the river to the dirt climb on Laughtondale Gully Road, meeting Old Northern Road at the top of the headland. For those wanting to keep their wheels a little cleaner, turn right onto the Old Northern Road early at Wisemans Ferry. 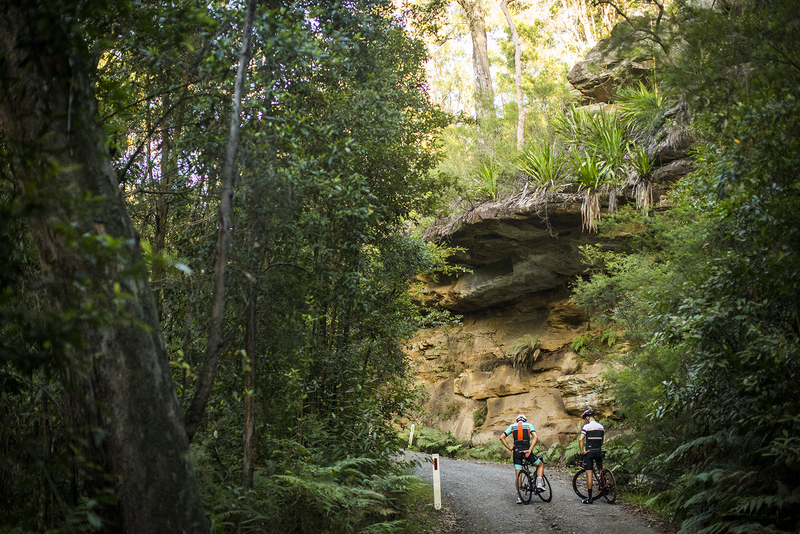 Follow the Old Northern Road all the way back to Mid Dural Road, refuel along the way at local fruit stalls, and follow your original path back through Galston, up the switchbacks and home to Hornsby. Multiple flights operate daily to Sydney from around the country. From the CBD (20-25 minutes from airport) it’s approximately a 40min drive from the city to Hornsby. 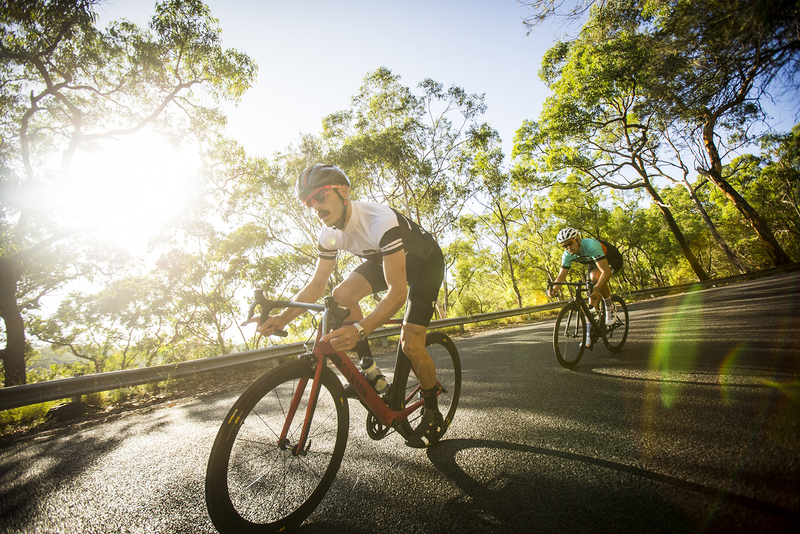 If you’re staying around this area or even across the north side of the Harbour Bridge, you’re looking at around 25km ride up the Pacific Highway (more like a busy road) to Hornsby – for what is a very big day on the bike. If you have a little more time up your sleeve then it’s definitely worth investigating an overnight stay around Wisemans Ferry. There are a multitude of options to suit budgets large and small, and it’s also a place that’s kid-friendly. Our pick from the bunch is the Del Rio Riverside Resort. They’ve got everything from camping spots through to riverside villas and facilities to house a group as large as you can lure along. With little creativity required, you’ll find a number of ride routes all accessible from this side of the river. A quick punt across the water and there’s even more on offer. Pack the mountain bike if you’ve got the time! 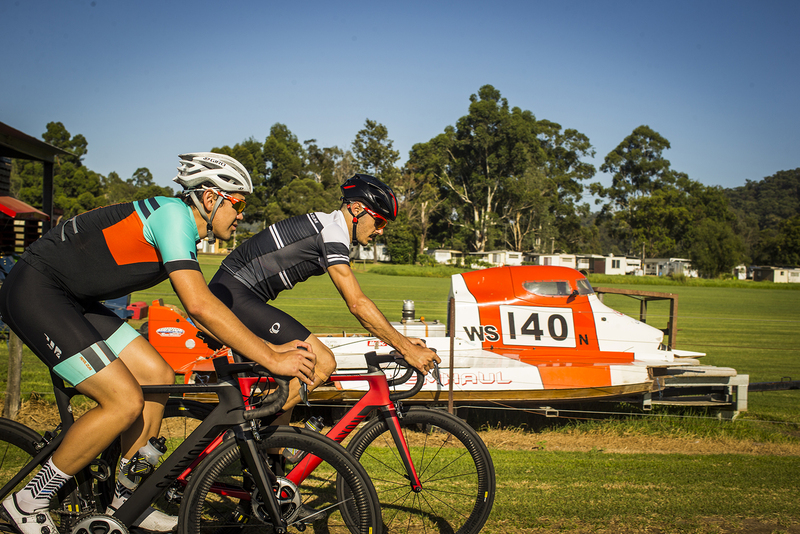 Cheers to the folks at Canyon Australia for supplying a couple of Aeroads for our pilots to use; meanwhile, the latest offerings from Pearl Izumi kept us comfortable and looking ultra-sharp across the weekend (we’ll be honest – we spent more than one day around here!). We wouldn’t have made it through the weekend, cutting back and forth for our enthusiastic photographer, if it weren’t for adequate fuelling from Endura.